Media captionDerek Mackay: "We have learned of the Brexit bombshell which is lower economic growth and lower revenues as a consequence." Scotland's capital budget is to be given an extra £800m over the next five years as part of an investment package, the UK Chancellor has said. Philip Hammond made the announcement as he unveiled his Autumn Statement in the House of Commons. The money is the result of increased spending on infrastructure in the rest of the UK. Mr Hammond said the additional funds would give Holyrood greater ability to boost productivity and promote growth. 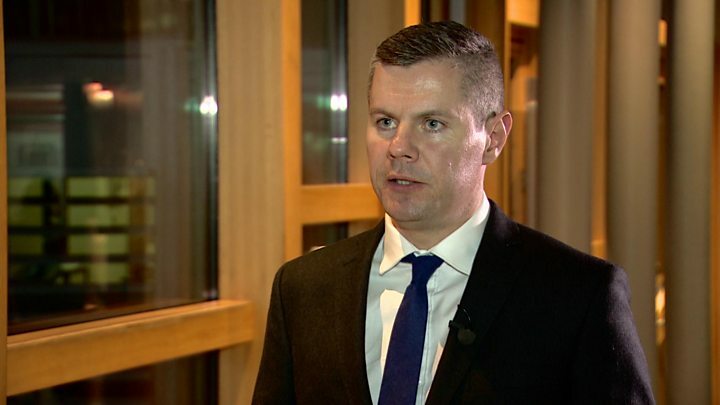 However, Scotland's Finance Secretary Derek Mackay said the chancellor had revealed a "Brexit bombshell". He told BBC Scotland's political editor Brian Taylor: "We have learned of the Brexit bombshell which is lower economic growth, lower revenues as a consequence, higher borrowing and higher inflation that will impact on the economy generally and it will impact upon household budgets." Mr Mackay also expressed dismay that there was no new funding for the NHS or reassurances given about the UK's relationship with Europe's single market. The Scottish government's overall budget is expected to fall in real terms regardless of the increase in funding for infrastructure projects. Mr Hammond announced a new National Productivity Investment Fund of £23bn, which he said would be spent on innovation and infrastructure over next five years. The Barnett Formula means that the Scottish government will be allocated £800m over the period until 2020-21, the chancellor said. Mr Hammond added: "Economically productive infrastructure directly benefits businesses. But families, too, rely on roads, rail, telecoms - and, especially housing." It will be up to the Scottish government to decide how to spend the increase in the capital budget. An increase in capital spending had been a key demand of the Scottish government ahead of the chancellor's statement. Scottish Secretary David Mundell said it was now for the Scottish government to "step up" and ensure the money "makes a real difference to productivity, jobs and growth in Scotland". He added: "The UK government's decisions today mean a secure economy based on the broad shoulders of the UK, more funding and more powers for Scotland." But the SNP's economic spokesman at Westminster, Stewart Hosie, said Mr Hammond had failed to address the Brexit "elephant in the room" in his statement. Mr Hosie said the chancellor had only made a "glib reference" to the UK's decision to leave the EU and accused him of using a tactic of "deflection" to avoid the topic. He also said positive measures outlined in the spending blueprint would just make a "brutal regime slightly less brutal". Scottish Labour leader Kezia Dugdale said the Autumn Statement was "more of the same old Tory mantra - cut, cut and cut again". Elsewhere in his statement, the chancellor confirmed talks would begin on Stirling's bid for a City Deal, which also includes Clackmannanshire. And he indicated that a City Deal for Edinburgh would be agreed, and that proposals from the "Tay Cities" of Perth and Dundee would be considered. Mr Hammond said this meant every city in Scotland would be on course for a City Deal, which gives local areas greater powers and freedoms to help support economic growth, create jobs or invest in local projects. Scottish ministers had been privately anxious that the entire revenue settlement for the year ahead, 2017/18, might be unpicked, with adverse consequences. That has not happened - and there will be a degree of relief at Holyrood, albeit the spending constraints remain in place. Then there is the extra money for capital investment as a Barnett consequential of the spending south of the border. It adds up to £800m - and, when announced, Tory backbenchers joined in a panto-style vocal challenge to the SNP benches. Rejoice, they appeared to be shouting, rejoice. To be clear, the capital spending allocated to the Scottish government will be welcomed by ministers. However, they note that it is spread over four years, from the current 2016/17. They argue further that, taking all the figures into account, there remains a cut of about 8% in capital spending in real terms over the extended period from the Conservatives first entering Downing Street in 2010. Meanwhile, Mr Hammond said growth next year will be considerably slower than was expected before the vote to leave the European Union, according to the Office for Budget Responsibility (OBR). The OBR expects the economy to grow by 1.4% in 2017, down from the 2.2% it predicted in March. The growth forecast for this year has been raised slightly to 2.1% from 2.0%. But it expects growth to be 2.4 percentage points slower in the next five years as a result of the Brexit vote. Mr Hammond stressed that the forecast for 2017 was still equal to the International Monetary Fund's prediction for the German economy, and ahead of its forecast for France.